Speaking at Blackfriars Station in London, which Network Rail is currently fitting with solar panels and rainwater harvesting systems in order to be more resilient against power cuts, Ms Spelman said the UK is already investing £200 billion (US$287B) over the next five years. For a country like Britain, with a GDP of roughly $2T (compared to the US GDP of $14T), $287B is a big chunk of change to waste on global warming scares. In other words, we need to savage the economy so you don’t lose your WiFi connection. Algore approves, of course. Today is Victory Day for much of Europe – celebrating the end of World War II. 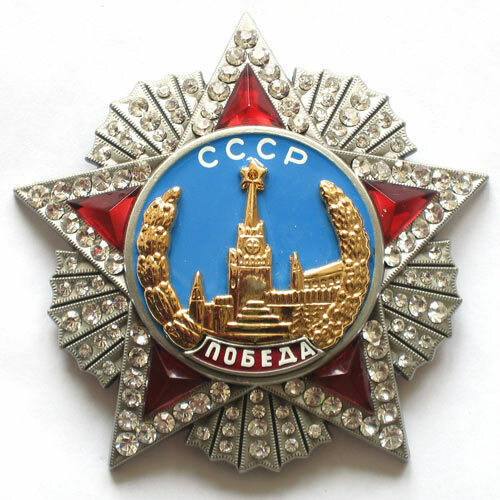 My father-in-law, who turns 90 on June 25th, is a decorated veteran of the Soviet Red Army. Twice wounded, the second of which took him out of action before his unit reached Berlin, he was assigned to an artillery unit of the 1st Ukrainian Front under the command of the legendary Marshal Georgy Zhukov. For the Red Army, the cost of victory was immense. Victory Day is a big deal in Russia – kind of like our Independence Day. Surviving veterans are treated with honor as “Heroes of the Soviet Union.” Being a huge fan of WWII history, it was particularly fascinating to hear my father-in-law’s war stories. The ethanol controversy (more here) is heating up again as the EPA announced a mandate last fall to increase the amount of ethanol in gasoline from 10% to 15% (more here). Despite the growing evidence that ethanol costs more, is not really environmentally friendly, drives up the price of food, and is actually ruining engines on vehicles (older than 2007). The ultimate slap in the face is that your tax dollars are being used to ruin your car (more here). The recent revelation that ethanol ruins small engines (like lawn mowers and weed whackers) has created a niche market for “Boutique Fuel” – pure (no ethanol) gasoline for small engines. Of course, this comes at a pretty stiff premium (story here from Popular Mechanics). Small-engine repairmen tell PM that ethanol mixed with gasoline is corroding and damaging chain saws, string trimmers and other outdoor equipment at an alarming clip. As a result, a new market is growing in U.S. hardware stores: Ethanol-free gas packaged in small cans that sell at a premium but promise to make your small engines last. Repairman and small-business owner Rich Herder doesn’t mince words about the damage ethanol in gasoline is doing to the small engines in outdoor power equipment. “It’s the biggest disaster to hit gasoline in my lifetime,” Herder says. He owns McIntyre’s Locksmith & Lawnmower, a service business in Westfield, N.J. Founded in 1898 to refurbish saddles, the business today repairs more than 5000 machines a year—mostly pieces of outdoor power equipment, and many of them, according to Herder, damaged by the alcohol in today’s gasoline, known as E10 for the 10 percent of alcohol it contains. Herder estimates that as much as 75 percent of that work is not due to normal wear and tear, but results from the use of ethanol, which can cause rust and carbon deposits inside the engine, dissolve plastic parts and more. And if repair shops like Herder’s are already busy, you have to wonder what will happen this summer when gas pumps begin dispensing E15 gasoline; the Environmental Protection Agency recently approved the fuel for cars built after the 2000 model year, but the fuel could hit small engines even harder than E10 does. But now, because of all that ethanol-based wear and tear, a nascent industry is starting up: Ethanol-free gas, distributed in cans for owners of small engines. Deposits and corrosion aren’t the only reasons alcohol is hard on today’s small engines. The power plants are easily ruined by bad fuel because they lack the sophisticated computer-controlled ignition systems found in today’s cars and trucks. The alcohol can cause the fuel to ignite at the wrong time in the combustion sequence, ruining parts in the process. “The pistons are the first to go,” Herder says. “They look like they’ve been hit with a hammer.” Clearly the time for an alternative has come. With congress in the pocket of agribusiness and the EPA mandating even more ethanol in fuel, the alternative is Boutique Fuels. Thank you government – BOHICA consumers! The phenomenon of fuel-related problems has become so severe that the niche market for specialized fuel is growing fast. Tidily packaged little metal cans containing ethanol-free gasoline were just an oddity a few years ago; now they’re sold in hardware stores and by power equipment dealers, and people are taking specialized fuel seriously. There are at least three brands to choose from: MotoMix, from outdoor power equipment manufacturer Stihl USA, SEF from VP Racing Fuels and Truefuel from TruSouth. Of the three, only Stihl relies on an outside-contract chemical manufacturer to make its boutique fuel: Johann Haltermann, Ltd., a company that makes, among other things, precisely blended fuel for testing vehicles. Stihl was likely the first outdoor power equipment company to enter the boutique fuel market when, more than 20 years ago, it was so concerned about fuel quality in Germany that it introduced packaged fuel for its equipment sold in Europe. The market for these fuels is still so new that there’s no generally recognized name for them. But regardless of whether you call this stuff—boutique fuel, packaged fuel or canned gas—it’s an end run around the gas pump. Sold as straight unleaded gasoline or blended with oil for high-rpm two-cycle engines in chain saws, blowers and string trimmers, it’s expensive stuff, costing anywhere from $5 to $8 per quart. Despite the high price, customers might be willing to pony up if it means seeing an engine or its components run for several trouble-free years rather than seeing the engine destroyed or damaged by ethanol—after all, avoiding just one ruined engine might be worth the cost. Imagine that – pure gasoline at $20 – $32 a gallon. That works for me. I just love my government so much – BLECH! Been to a gas station or grocery store lately? How’s that hopeNchange thing working out for ya? If you’re frustrated with high prices on just about everything, here’s a way to vent that frustration and get a message out (story here). This time around, the Tea Party is taking action to draw attention to the fact that Barack Obama is gouging Americans by making sure gas prices are high by causing war in Libya, not opening Alaska to drilling and saving our national energy reserves to power Chinese tanks after China’s inevitable invasion of the U.S. We spoke with Chris Lotto, Arizona activist and co-creator of the “The ‘Hope and Change’ Sticky Note Campaign,” a movement that places anti-Obama sticky notes on gas pumps. By the end of this week, the page had over 8,000 fans who had sent out over 50,000 invites to join and dozens of pictures were rolling in of notes placed on gas pumps from Ohio to Wisconsin to Texas. Part of the charade employed by the existing Regime is to continue to make people believe that they are alone in their dissent and/or dissatisfaction with the ruling class. They need to isolate you and make you feel YOU are the outlier. A recent example is the derision lobbed at those who questioned Obama’s background and credentials. This has been written about extensively in various professional military training manuals. It has also been the subject of many papers, dissecting the evolution of an underground movement that overthrew an entrenched Regime, where to outsiders, the “sudden collapse” of an oppressive regime catches them by surprise, when in fact, it was predictable all along. The reason for the “sudden collapse” is that the group knowledge finally reached a tipping point, where the “dissenters” realize that they are the MAJORITY, not the minority as the Regime would have them believe. 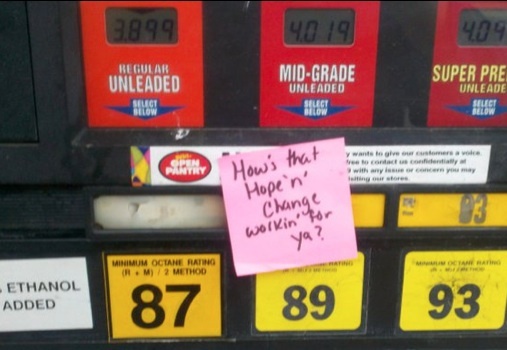 Sticky notes, as advocated at gas pumps and on stores shelves, represent what is known as “Counter propaganda”. It will be interesting to see if this gathers momentum and has any legs. The sticking-political-messages-on-other-people’s-commodities tactic shows no sign of abating. It’s a long way to 2012, and the GOP proper has completely lost control of its constituency, so everyone should prepare for what’s probably going to be the most ugly election in recent history, and, with every free surface in the nation plastered with neon squares, I mean literally ugly. If you don’t have a US passport you might want to get one now before a proposed new application form is adopted. This is particularly true if you don’t have a copy of your long form Birth Certificate. According to this story, many of the questions are almost impossible to answer. This form is a bureaucrat’s dream come true – Kafka’s Catch-22. With the stroke of a pen some government drone who may be having a bad day has the power to deny your passport. You’re probably thinking, “How could they possibly know any of this – I’ll just make up a bunch of stuff.” That’s true, but that’s also the beauty of it. They don’t have to know any of it. If they deny your application, the onus is on you to prove it. As your dog knows, there’s a lot of information in poo. If you own a dog, you’ve probably noticed that they just have to sniff every pile of poo they encounter. A healthy sniff or two reveals a lot about the animal that left it. Human poo is no different and according to this story (from Discovery News), scientists have found a way to make use of it to diagnose health problems. Though its certainly not filled with gold, turns out there is a pot at the end of the rainbow, and it’s made of porcelain. For years, sagely, health-conscious individuals have read the contents of toilet bowls, seeking oracles of good or bad health. But never before has this practice been more colorful. Scientists have genetically engineered E. coli bacteria to work safely as a biosensor that can detect the presence of toxins and secret an indicator pigment. The synthetically engineered bacteria (which has had its bad bacteria parts removed) could be used to test water or air samples for pollutants such as arsenic or carbon dioxide. Arsenic in the water, the sample turn blue, for example. But that’s not all. By the year 2039, the scientists — who hail from Cambridge University –think that their so-called E. Chromi could be mixed in with a special probiotic yogurt, which when eaten, would colonize the bowels and release pigments in the presence of diseases such as cancer, stomach ulcers and salmonella. If your poo was green, for example, you might have an ulcer, or if it turned orange, you may want to get tested for colon cancer. The scientists designed E. Chomi using standardized sequences of DNA, known as BioBricks, and inserted them into E. coli bacteria. In 2009, they won the Grand Prize at the International Genetically Engineered Machine Competition (iGEM). Since then, the original team from Cambridge University in the UK has joined with designers Alexandra Daisy Ginsberg and James King to explore the possibilities of their technology. Once upon a time a kid could set up a lemonade stand virtually anywhere and make a few bucks. Sadly those days are over as you are now subject to government harassment and even prosecution should you try it now. In many areas you need a business license and Health Department inspection to set up a simple lemonade stand. But wait, there’s hope. You can do this one day a year on Lemonade Day. That’s right, one day a year many cities will allow this so that kids can “learn and appreciate” entrepreneurship. Actually, it’s a lesson in government regulation (story here from the LA Times). My 8-year-old recently got the lemonade stand itch. So we started laying plans to enrich her college fund by enticing passers-by with white chocolate-pistachio cookies and juice from organic lemons. Fortunately, our property backs onto one of the busiest paved urban trails in America, bustling on weekends with cyclists, rollerbladers and pedestrians. Visions of dollars danced in our heads. Googling for the perfect lemonade recipe, we soon found a site promoting a May 1 “national” event called Lemonade Day. This event, organizers say, is an “initiative designed to teach kids how to start, own and operate their own business — a lemonade stand.” What better day to begin building our lemonade empire? After shopping for her raw materials, I gave my kid a bedtime primer about starting a business. How much profit do you make after expenses? How should you promote your business? Give the customer a great product. She soaked it up and went to sleep all inspiration and smiles. Then I got to thinking about something I hadn’t discussed with her: government regulations. The author relates a three day odyssey of contacting various government agencies about setting up a simple lemonade stand. The bottom line was that under normal circumstances, a simple child’s lemonade stand was out of the question. They would allow it, however, for Lemonade Day. What the Lemonade Day organizers should teach the children, said the health official, is about the importance of learning and obeying the government regulations that prohibit lemonade stands. If we had made it past the health and parks departments, my kid would have been stymied by zoning laws that prohibit lemonade stands in residential neighborhoods. Overcoming that barrier, we would have hung our heads at the daunting costs of business and vending licenses, not to mention taxes. 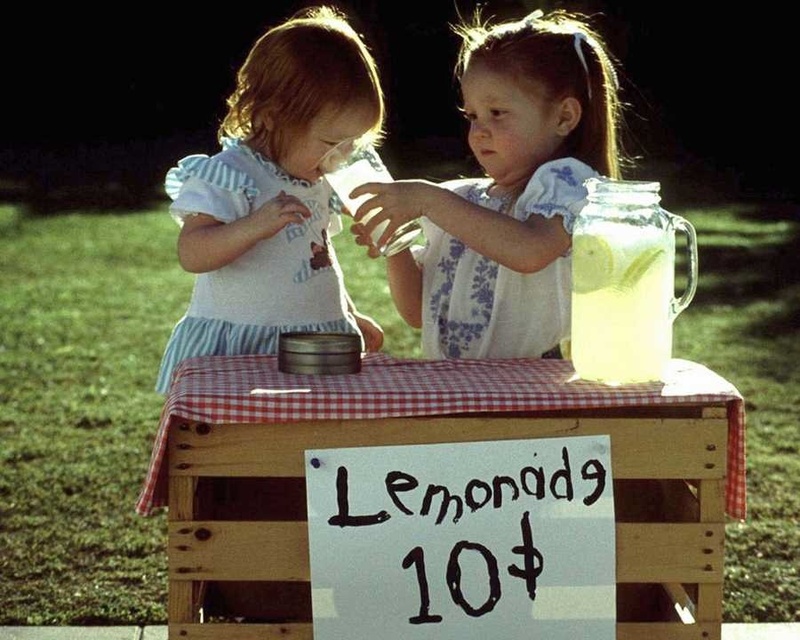 Lemonade Day is promoted as a way to “inspire a budding entrepreneur!” But it is actually a dispiriting lesson about how hard it now is to become an entrepreneur, whether you’re an adult or a child. It is about how even the most harmless enterprise, the humble lemonade stand, has been sacrificed on the altar of government regulation. “Obeying the government” – that’s the real lesson here. The author handles it well. Learning to be an entrepreneur “starts with a lemonade stand,” say the organizers of Lemonade Day. But they don’t want to talk about the regulations that make it impossible for my kid to become a lemonade stand entrepreneur. They tell me it is “silly” and “beside the point” to focus on the regulations. I am told that Lemonade Day is about kids learning to “give back to their communities,” “do better in school” and “open bank accounts.” It is not about something so self-serving as making a profit by selling a good product. That is the old American way, but the new way is living with rules that banish the lemonade stand to one government-approved day a year. What are my kid and I going to do on Lemonade Day? We are going to set up a stand in one of the permitted locations — in a park or at one of the approved sponsors — with hundreds of other kids doing the same thing. But our “secret ingredient” is that we will hand out leaflets explaining why operating a lemonade stand makes my kid and yours not just a hopeful entrepreneur, but an actual lawbreaker. Next year they should rename it Regulation Day.